Update: A Fleksy representative contacted us to say that the keyboard will be available as a free download to all Gear S owners, but will not be pre-installed. The title of this post has been changed to reflect this. The Gear S is an interesting device, not so much for its hardware as for its approach: Samsung decided to equip the smartwatch with a stand-alone wireless connection so it can work just fine on its own, thank you. Of course, that also means that for at least some of the time you'll need to operate it like a smartphone strapped to your wrist... which can get kind of awkward. 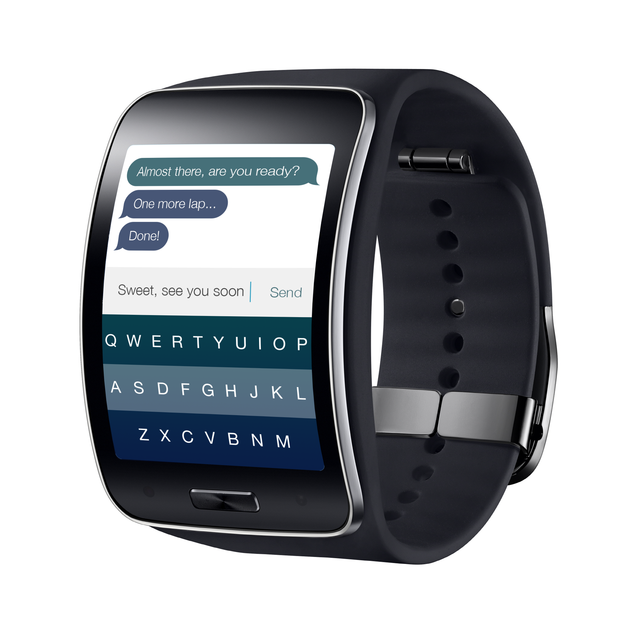 To help ease the situation, Samsung is partnering with Android keyboard developer Fleksy, pre-loading the unique input method on the Gear S.
Fleksy, the self-styled "fastest keyboard in the world," is already available on the Samsung Gear 2. Those watches are powered by Samsung's Tizen operating system, so it's no surprise that Fleksy has something ready to go for the Gear S. Even so, it's a big deal for Samsung: including both its own standard keyboard and a third-party keyboard is notable for a company that tends to be very self-centered when it comes to software. You could also see it as a tacit admission that even Sammy realizes interacting with touch elements on a two-inch screen is problematic, and Fleksy's celebrated gestures and auto-correct could help. Similarly, Swype used to be in vogue as a pre-loaded option for OEMs, including some Samsung phones and tablets. The Gear S is set to launch in October. It doesn't have a price yet, but the Fleksy keyboard will be included free of charge. SAN FRANCISCO — September 03, 2014 — Fleksy, the fastest keyboard in the world, announced a partnership with Samsung today to bring its keyboard to the newly launched Samsung Gear S smartwatch. The partnership makes Fleksy the only fully integrated third-party keyboard on Gear S, allowing users to type in every app right from their wrist. Through the partnership, Fleksy will be available for free for all Gear S users. “We are delighted to announce our first OEM partnership today, and we are excited to be part of the Samsung ecosystem” said Ioannis Verdelis, Founder and CEO of Fleksy. “This is a big milestone for Fleksy, and we plan to solidify our position as the leading typing technology for smart devices over the coming months”. Fleksy confirmed it will also continue support for its Fleksy Messenger app, available for Samsung Gear 2 and Gear 2 Neo smartwatches, with a major update coming soon. “With thousands of daily downloads of Fleksy Messenger, we are already publishing one of the Top 3 selling apps of the Gear ecosystem” said Kosta Eleftheriou, Founder and CEO of Fleksy. “We are very excited by the growth of the wearable tech market, and proud Fleksy has already established itself as the leader for typing on watches”. Fleksy confirmed that Samsung will pre-install Fleksy on all Gear S demo hardware, and will be providing demonstrations of its keyboard on Samsung Gear S during the IFA trade show taking place in Berlin this week.